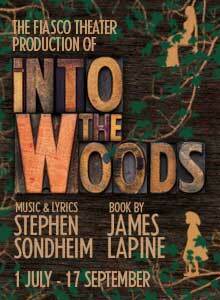 It has just been announced that Stephen Sondheim and James Lapine's musical Into The Woods is to open at the Menier Chocolate Factory on 12th July (previews from 1st July) for a run until 17th September 2016. The American theatre company Fiasco are bringing their reinvention of the show to London following a successful season in New York . They will be using ten actors, a number of musical instruments and vivid imagination to ensure that the the show is "reimagined as never before". This production, which received the 2015 Lucille Lortel Award for Best Revival, will include the original US cast. This production is presented in association with Michael Harrison Entertainment and David Ian Productions. Noah Brody and Ben Steinfeld direct with music supervison by Matt Castle, choreography by Lisa Shriver, set by Derek McLane, costume by Whitney Locher lighting by Christopher Akerlind and sound by Darron L West.